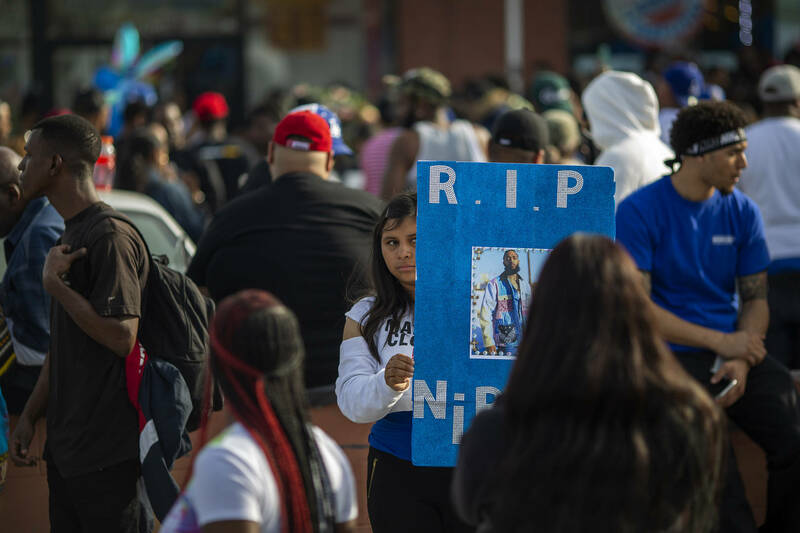 There have been numerous reports on what went down in the moments leading up to the fatal shooting of 33-year-old rapper Nipsey Hussle. There are some who state that Nipsey and his suspected killer, Eric Holder, knew each other from around the neighborhood. However, there are others, including a man named Herman "Cowboy" Douglas who claims to be a close associate of Nipsey's, who says that shooter approached Nipsey by introducing himself as a rapper. The L.A. Times was in the neighborhood where Nipsey was murdered and spoke to Douglas in an on-camera interview. Douglas explained his history with Nipsey, a friendship that he says has spanned 16 years. He also says that he was with the rapper just seconds before the gunman pulled out a firearm and shot Nipsey, along with two others. "Sad situation. The homie got killed through the jealousy. It wasn't nothing but jealousy and envy. It was a senseless murder. Nipsey was doing positive things in the community trying to save lives, and for one of the people that he was trying to save, to come back and kill him? It was nothing but jealousy and envy. It's a sad situation. The world is gon' miss Nipsey. Not just this neighborhood, but all around the world." "I've known him since about 2003 since he was a youngster...since he was about 18, 19-years-old. I came home from prison, he was out here selling his CDs, so we sold CDs together. We had dreams of doing it big. He did it big and he left his niche on earth," he said. "We used to use the parking lot as our office before we even had an office in the building. So every day we would show up like we was at the office." "Me and Nipsey was talking, and the dude that shot him, he came and shook our hands. Said he was a rapper and this old bulls**t. Shook our hands. The dude went and got his burger. He left. When he left, I went and took my food in. As soon as I took my food inside the building, the dude came back around the building bussin'. So, I might have left Nipsey's side maybe, three seconds. I left him maybe, approximately three seconds that I had left Nipsey and the dude came and shot him." "We know who he is. It's no mystery," he continued. "It's all hate and envy...Nipsey didn't deserve to die like that. What seems to be a less talented rapper had envy and hate in his eyes. It was no motive. It was no beef." While this interview seems to have been conducted before Eric Holder was arrested, the L.A. Times reports that Holder was, in fact, a rapper by the name of Fly Mac, however, both he and Nipsey were allegedly already affiliated through the Rollin' 60s Crips. Holder is reportedly being held in solitary confinement as he awaits his day in court.